This just in: apparently I have racked up a *&^%-load of roaming data charges on my Android tablet. I just assumed, as was the case in Holland/Germany/Switzerland, I would have no internet access on the tablet unless I was hooked up to a hotel's wifi. I still managed to get GPS in those countries, and nothing else, while out "roaming." This is not the case in Canada, so without a "data plan" for this fair country, I shudder to think of what my bill will be. AT&T has disconnected my data usage, and I can't get them on their 24/7 phone line "due to the holiday." Yep, not the 4th anymore, guyz. Anyway! 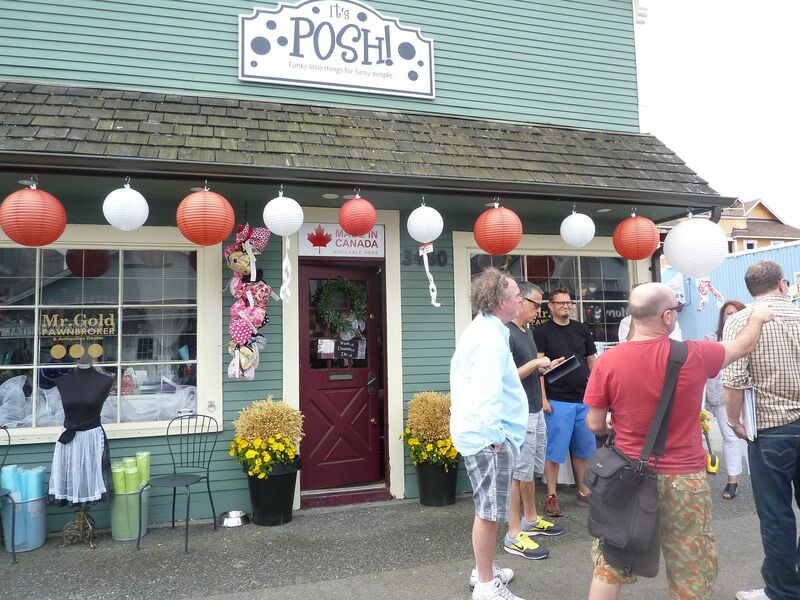 Storybrooke, that all-American town, is in Canada, so international roaming applies. Both on tablets, and on foot. Yesterday, D, midnightsjane, and I headed down to Steveston. This little fishing village is worth a trip even if it didn't double as a familiar TV town. Very cute along the waterfront. We wandered down the main drag and saw Granny's Diner, Mr. Gold's shop, the Storybrooke bakery, the Storybrooke Pet Hospital, and the "library" (sans clock tower, of course). It was pretty non-crowded, being a Friday, which was good, but I was dismayed as we approached Mr. Gold's shop to see a big crowd in front of the store. I thought, "is this how it's going to be all these fans crowding things so we can't snap photos?" It wasn't "fans", but no--it wasn't filming, either (which starts later this month). It was, however, the OUAT crew scoping out the set for some future episode. So that was fun. More pics of Storybrooke later. After our tour, we sat down for a yummy seafood chowder lunch, then headed back up to the city. We dropped Jane off at her place, then continued downtown. Our afternoon plan was to visit the Vancouver Art Gallery. That did not take up the entire afternoon, so we wandered back down to Gastown to give in to a few shopping impulses we'd managed to shake off earlier in the week. For only the second time on this trip, we got a spit of rain. It was mostly been sunny and beautiful this week. Thanks MUCHLY to midnightsjane for being such a helpful, fun, and gracious host! Many things looked familiar and ever so slightly "off". Did you buy that bag you were looking at? It was so nice to have you here, and I had fun touring around "Storybook" with you! Glad I got to meet Deborah too. She is such a warm and friendly person. It was a great visit, and I'm happy the rain held off. Awesome seeing you again, too, as usual! They also had one or two Highlander episodes set there. Only they actually called it "Steveston" in those eppies.